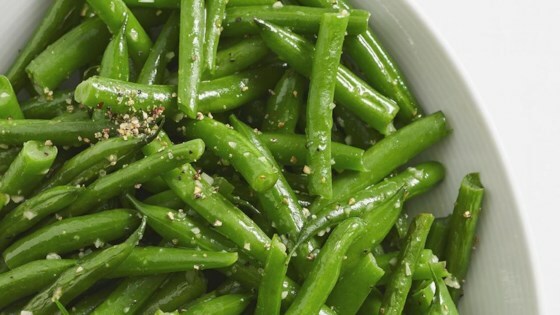 Place green beans into a large skillet and cover with water; bring to a boil. Reduce heat to medium-low and simmer until beans start to soften, about 5 minutes. Drain water. Add butter to green beans; cook and stir until butter is melted, 2 to 3 minutes. These were just ok. I used real garlic and more than called for-glad I did. A few pinches of lemon pepper doesn't add substantial flavor, nor were they all that buttery. Use real garlic -- dry, minced garlic didn't do anything for the green beans.